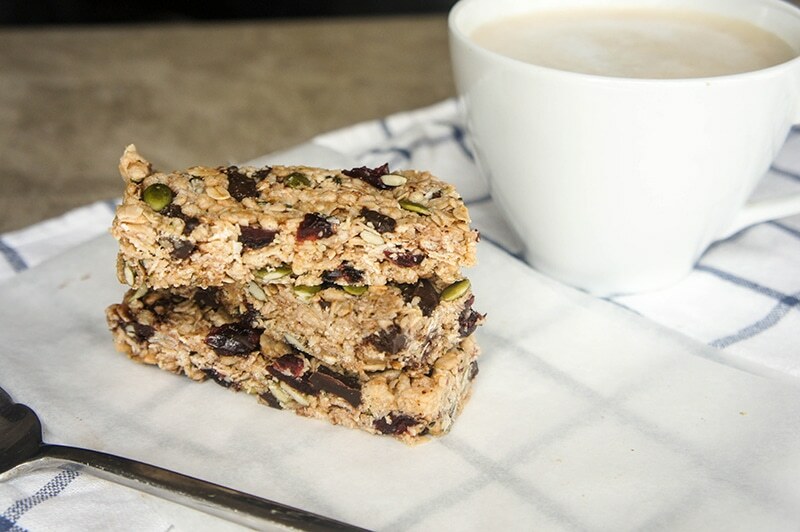 These homemade Cranberry Dark Chocolate Granola Bars are packed with superfoods – whole oats, hemp seeds and pepitas. Keep these in the freezer for easy grab-and-go snacks during the holiday rush for a healthy energy boost! Today’s post is a guest post from Michelle at Vitamin Sunshine. Earlier in November, my baby boy was born and Michelle was very kind to offer to guest post on my blog during this first month. 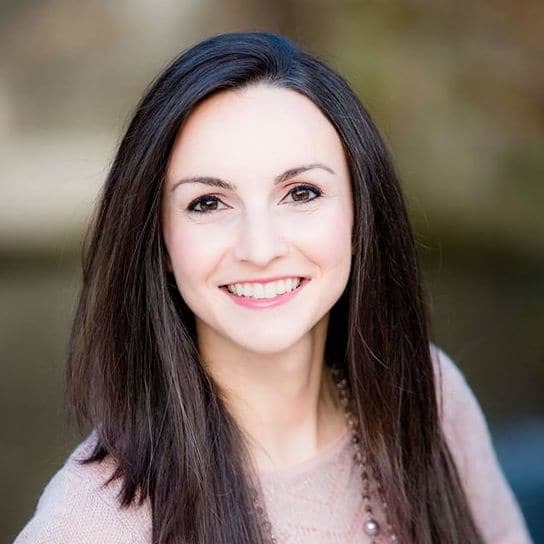 She has a fabulous food blog where she shares mouthwatering recipes low in sugar, gluten-free and always full of healthy ingredients. Check out her chewy irresistible granola cookies that are also gluten-free, and visit her blog for more recipe inspirations. To stay connected with her, follow her on Pinterest, Facebook and Instagram. I first came across Neli’s blog a few months ago and was completely hooked by her Apple Almond Cake recipe. I instantly knew I’d love her recipes because all of my favorite baking ingredients were used in her cake. When I found out she was having a baby boy, I felt another connection to her- I have a 15-month-old toddler at home and still remember the overwhelming emotion of bringing that tiny 6-pound bundle home last August. I started Vitamin Sunshine 3 years ago for many of the same reasons that led Neli to begin Delicious Meets Healthy– an outlet to share creative, produce-driven dishes that promote health and well-being. I believe that healthy food should not only nourish our bodies, but also be delicious, and balanced, meaning I would never promote a diet that completely restricts any food, other than for health-related reasons. I do, however, encourage experimentation with alternative ingredients (such as the hemp seeds in this recipe! ), to add variety and added nutrition to your diet. My journey to health began a long time ago. Growing up, I was overweight, and often sick. As I moved into my teenage years, I had had enough and wanted to take control of my health. I started exercising at home by myself every night and began losing weight. At school, a friend of mine had to run a mile and a half to make up for skipping a PE class, and I did it with her. Astonished I actually could run an entire mile and a half, I took up running and began running longer and longer trails. While my mom always fed us healthy meals, I started to pay attention to serving size and increasing my vegetable intake throughout the day. I learned to replace portions of pasta or bread with larger portions of vegetables, and the weight continued to come off. I lost a total of 50 pounds in a year– which is a lot for a 15-year-old girl! I felt like a new person, and my confidence skyrocketed. As my weight dropped, and my physical activity increased, I started relying less and less on the medications I had been taking for so many years. That was over 15 years ago, and with continued regular exercise, and a healthy diet full of whole grains, lean proteins, and lots and lots of produce, I have managed to stay near the healthy weight I obtained in high school. The past two years have thrown a lot of new challenges my way- pregnancy, caring for a newborn, and balancing being a new mom with a full-time job. 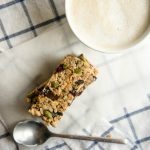 Recipes like these healthy Cranberry Dark Chocolate Granola Bars got me through those first few months of sleep deprivation. Infants don’t really give you a lot of time to yourself, and the intense need to care for them means your own needs- like eating proper meals, are thrown to the wayside for a while. I developed this cranberry dark chocolate granola bars recipe with Neli in mind. Becoming a new mom is an incredible challenge! Staying energized with nutrient dense foods is a must. I am not calling these lactation granola bars because I haven’t added any strange ingredients like brewer’s yeast. Through a lot of struggling and experimenting while breastfeeding, I found that just eating healthy food and drinking tons of water are the best options. Congratulations Neli! Caring for a newborn is the ultimate endurance exercise! 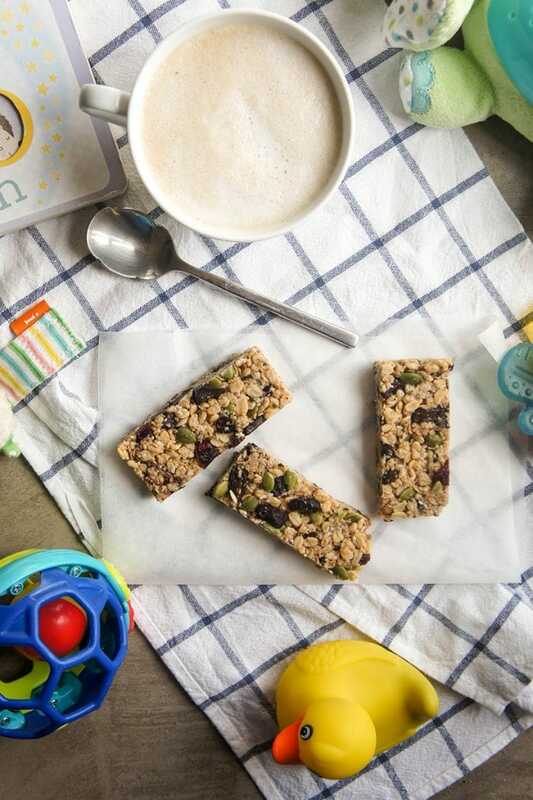 These crunchy and lightly sweet granola bars are low in sugar and high in protein thanks to whole grains and seeds. I love the combination of tart cranberries and very dark chocolate, but raisins would work as well. Keep these stashed in your freezer this holiday season for easy grab-and-go snacks and breakfasts when things get hectic. 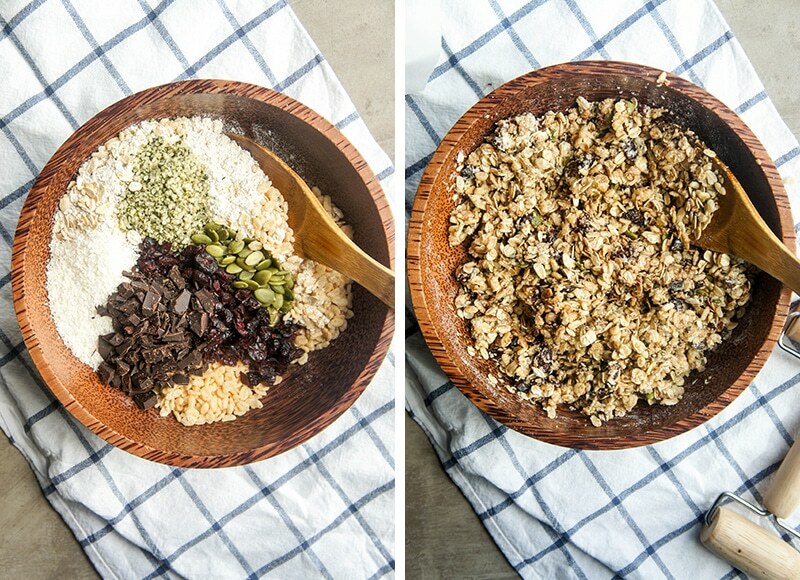 In a bowl, add together all dry ingredients. In a small microwave safe bowl, add liquid coconut oil and honey. Microwave for 20-30 seconds. The mixture needs to be warm enough the honey is very thin, but not warm enough to melt the chocolate. Pour the coconut oil/honey mixture into the dry ingredients, and mix until there is no dry flour left. Press into the bottom of a 8x8 pan. I line my pan with baking paper for the easiest cutting, but greasing the pan will also work. I use a pastry roller to make an even, packed layer, but a pint glass would work as well. 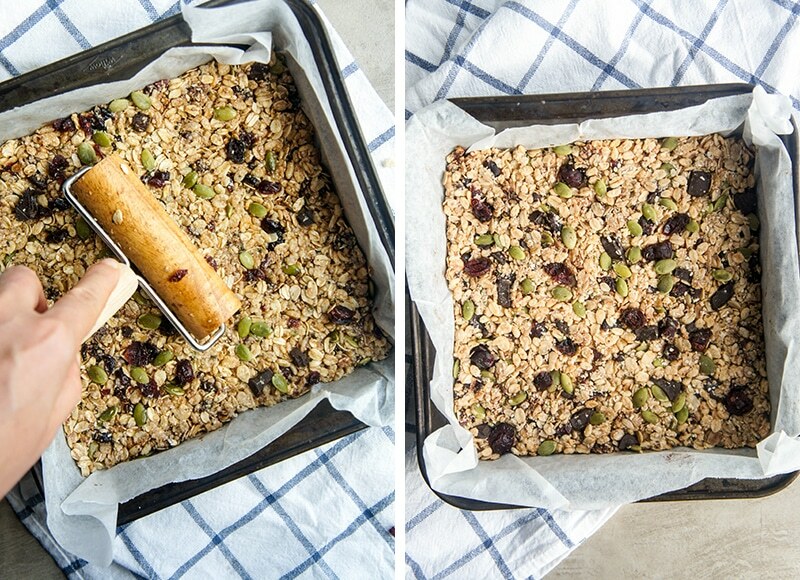 Bake for 12-14 minutes, until the top of the granola bars are lightly browned. Cool completely, and then refrigerate until the granola bars are chilled. Cut with a very sharp knife for best results. Store bars in the freezer for up to 1 month. I like to eat them right out of the freezer- they are crunchy when frozen and are more of a chewy bar at room temperature. 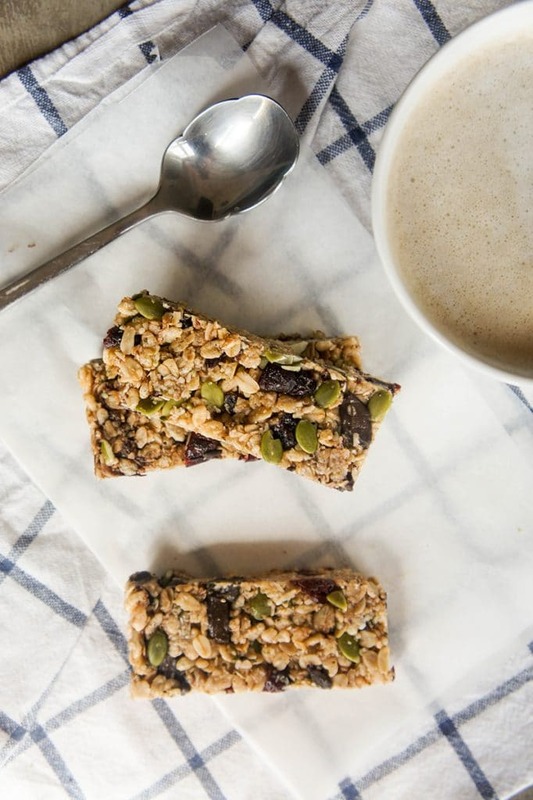 These granola bars sound like the perfect healthy snack or breakfast. Love that they’re refined sugar free and gluten free. Cranberries & chocolate sound like a wonderful combo. Yum! I keep meaning to make my own granola bars! These sound amazing! These look fantastic – definitely need something like this that is sweet, but not toooo sweet for those days when I’m craving a treat! Plus I just love cranberries too! I can’t think of too many things that go together better then dark chocolate and cranberry. The fact that it’s full of healthy food and refined sugar free just make it that much better!